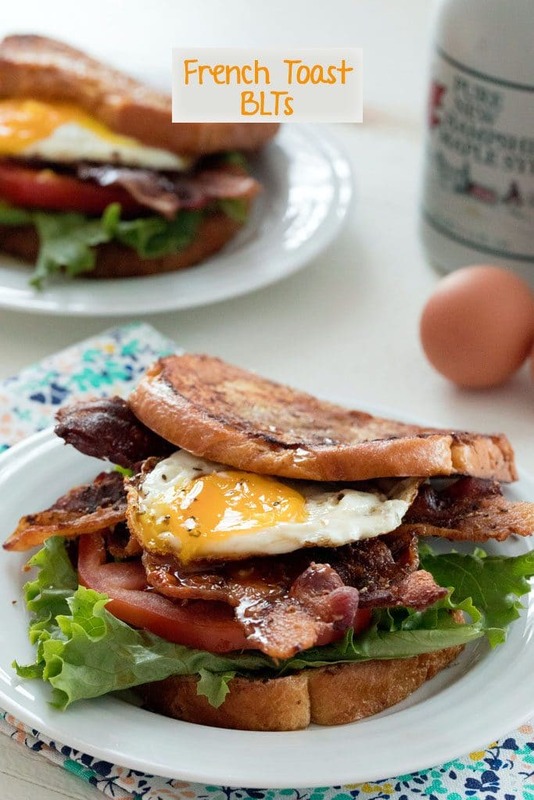 These French Toast BLTs will give you a reason to get out of bed in the morning! Made with challah or brioche french toast, crispy bacon, lettuce, tomato, and a fried egg, be sure to drizzle plenty of maple syrup over the top before serving! While there are obviously many perks to working from home and I am eternally grateful to be able to do so, I have to say that one of the best parts of WFH life is BREAKFAST. When I worked in an office, my breakfasts consisted of things like yogurt and those little oatmeal cups and grapes. And on a really good day, an English muffin with peanut butter. I have never been one of those people who has been able to take the time for breakfast before heading out the door for work, mainly because I’m not usually hungry first thing in the morning and I’m also a very slow morning mover. To be clear, it’s not like I’m making eggs benedict pizza and corned beef hash every morning now that I’m working from home… But I am eating way more eggs. 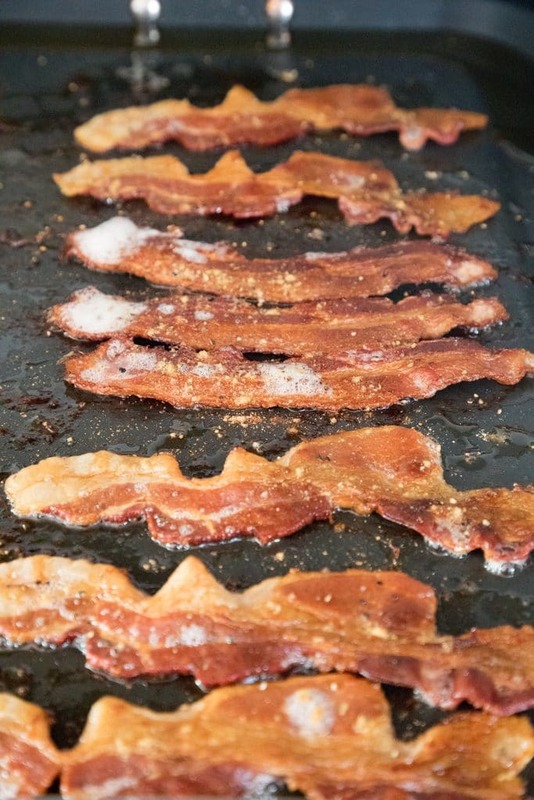 And if my husband happens to be home, too, I might even throw some bacon on the griddle. But I still consider these French Toast BLTs to be more of a weekend brunch food. They’re for those times when you can’t decide on sweet vs. savory (the perennial question I struggle with every time I’m at brunch) and when you want ALL of the brunch foods, but also want to maybe get in a vegetable or two, as well. They’re also perfect for any of you mayonnaise haters (I know you’re out there!) because this is a mayo-free BLT. Why? Because, though I am a mayo fan myself (in moderation, of course), maple syrup wins over mayo every time. It’s best to save these for the weekends because you’ll really want to sit down and savor them. If someone asks me for my must-have pieces of cookware, a griddle is almost always near the top of my list. Since I got one for my wedding, my bacon-making life has been exponentially better. I have this All Clad one (affiliate link) and HIGHLY recommend it. Also note that I always add crack blacked pepper and ground fenugreek to my bacon and it makes it soooo delightful. Fenugreek has maple syrup-like flavors, so it’s basically a match made in heaven. Penzey’s is the best place to shop (but be careful because you might end up ordering everything on their website)! 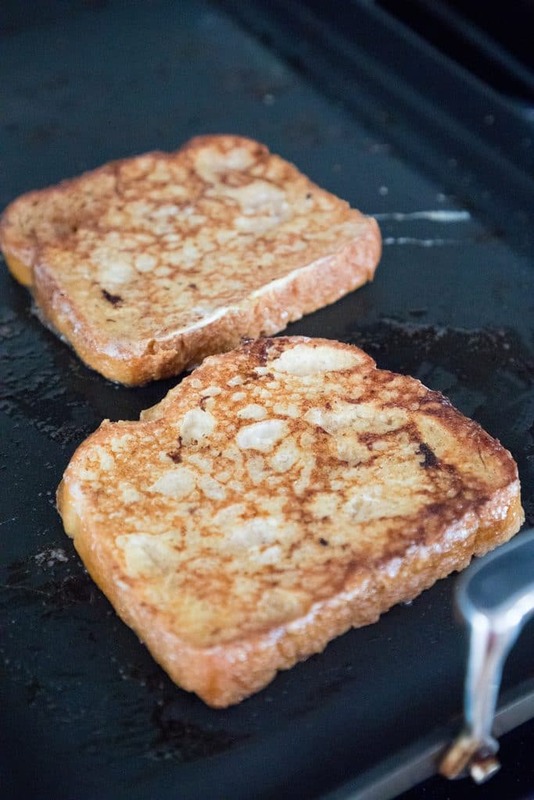 I don’t make french toast often and I really don’t know why because it’s ridiculously easy. I highly recommend making your French Toast BLTs with challah bread or brioche but it will certainly work with any kind of bread. My challah was pre-sliced when I bought it; generally I like it a little thicker, but it ended up working out perfectly for this BLT. Once I layered on the lettuce, tomato, bacon, and egg, it was one big sandwich! And be sure to drizzle plenty of maple syrup over the top of this bad boy. Worried about how maple syrup and tomato will go together? Don’t be! I know it sounds a little weird, but everything in this sandwich melds together so well and just works. I don’t think I ever want to eat bacon and eggs without maple syrup again! I’ll try to refrain from dipping my tomatoes and lettuce in maple syrup on a regular basis, but it might be tough. Honestly, if I ever go back to an office job, I’m going to need to find a way to bring delicious and fulfilling breakfasts in already prepared. It’s easy enough to keep a batch of french toast in the fridge that can be warmed up and I suppose you can fry eggs and bacon and warm them up at work, too. Then again, maybe I shouldn’t be eating French Toast BLTs every day? I’ll stick to the weekends with this one, but that doesn’t mean I won’t be dreaming about it every morning at about 7:00 a.m.
Are you with me that maple syrup is good on most things? Place bacon on griddle or in frying pan over low heat and sprinkle with half of the pepper and half of the fenugreek if using. After a few minutes, flip bacon and sprinkle with remaining pepper and fenugreek. Continue cooking until crispy. In a medium-sized bowl, lightly whisk together 2 of the eggs, milk, vanilla extract, and ground cinnamon. Dunk each slice of bread into the mixture until well-coated. Melt butter on a skillet over medium heat and place bread on skillet and cook for about 2-3 minutes on each side, until well-browned. Move to separate plate or pop in the oven set to low if you want to keep warm for later. In a separate small nonstick frying pan with, fry the remaining two eggs to your liking. 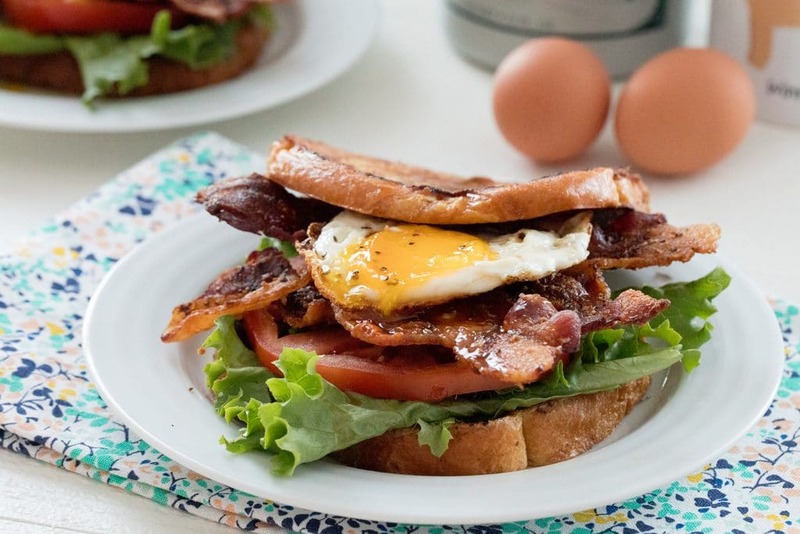 Assemble sandwich by piling lettuce, tomato, bacon slices, and egg on one slice of french toast bread and topping with another. Drizzle maple syrup over the top. 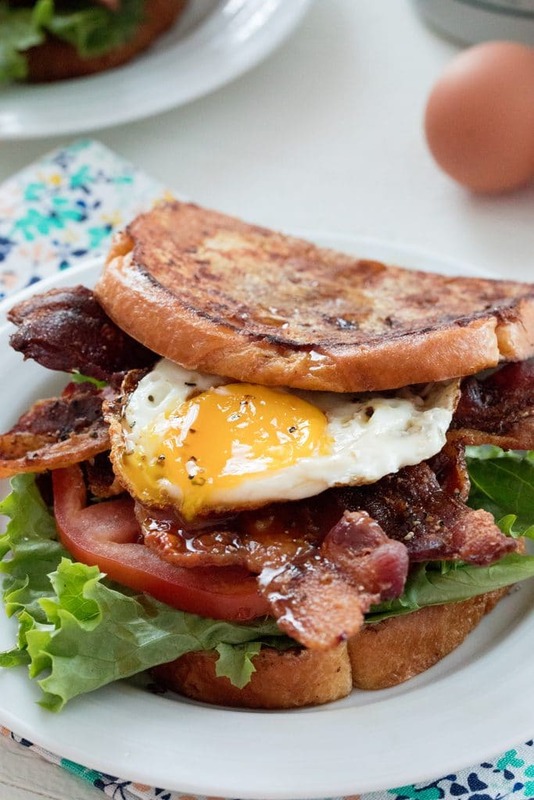 14 Responses to "French Toast BLTs"
That is a hilarious rule. I love it. I remember the first year we moved to MA, it snowed in October. We had moved there from San Francisco and I was shocked….and sick for 6 months haha. What a fun meal. WOW! This is likes the PERFECT brunch meal!!! OMG, this sounds heavenly! Runny eggs are my weakness & hello french toast! haha, I’m the same way. I won’t wear a coat til December. I’ll put on leg warmers and a scarf though, because those are just darn cute. This sounds like the perfect brunch dish! Thanks for sharing! Pinned! this is an absolutely brilliant idea 🙂 yum! Wow what a great brunch idea! Or maybe dinner tonight! This looks like a delicious brunch, and I love maple syrup on most things. I have been the worst this year with the winter; I just want to come home, stuff my face, and go to bed. I love this take on a classic BLT! you had me at BLT! then to add in the idea of french toast! YUM! What a great idea! 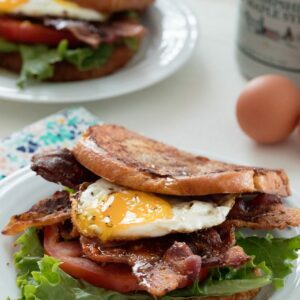 my mouth is watering from the crispy bacon and the egg on top.